"Trump trumped by Lord Lyon in arms race"
While we were in Las Vegas, taking care of some business for my mother, we found the following bit of heraldry at an intersection. Challenger School (well, there's three of them in the Vegas area (and 22 others through five western states), so maybe it would be more accurate to say Challenger Schools) caters to pre-school, kindergarten, elementary and middle school (what we used to call "junior high" back in the olden days when I was growing up) students. They're really proud of their curriculum, as you can tell from their logo: a coat of arms-like device with an painter's palette and treble clef in the first quarter; an open book and pair of compasses in the second; a globe of the earth in the third; and a microscope and a laboratory beaker in the fourth. The motto scroll says "Scientia * Opus * Virtus"
Once again, this is the sort of thing that you get when you let a committee (one with little or no experience with heraldry) design your logo; what I have come to call the "kitchen sink" school of heraldry, one where they try to throw in everything about themselves, including the kitchen sink. Once again, here we have a case of, well, yeah, it's nice that they're trying to use something like heraldry for their logo, but the result is a bit less than satisfying. 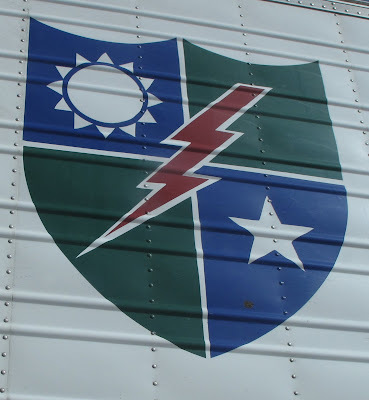 Anyway, on the way we passed a large truck with some heraldry on its side. So of course we had to have some pictures (below, one from the door of the cab, one from the side of the body of the truck). So, naturally, when I got the time I did a little research. 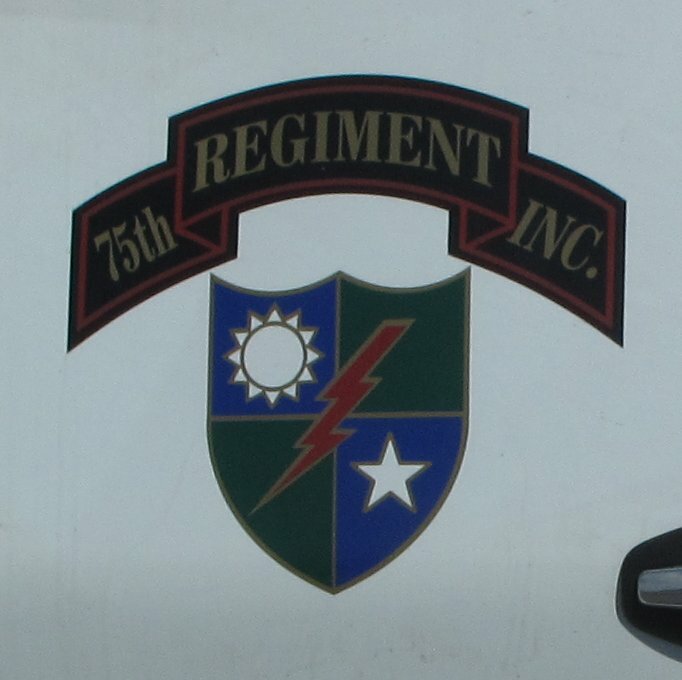 It turns out that shield is the emblem of the 75th Infantry Regiment, the Rangers. Still, it was fun to see a coat of arms, even is not the greatest design, while driving down the highway. From Little Snoring (leading one to believe that there is, somewhere nearby, Great Snoring, or at the very least Snoring), to Bishop's Itchingon, to Shitterton, and a whole lot more, a reader recently pointed me to a March 9, 2016 article by BBC Culture entitled "Why does Britain have such bizarre place names?" 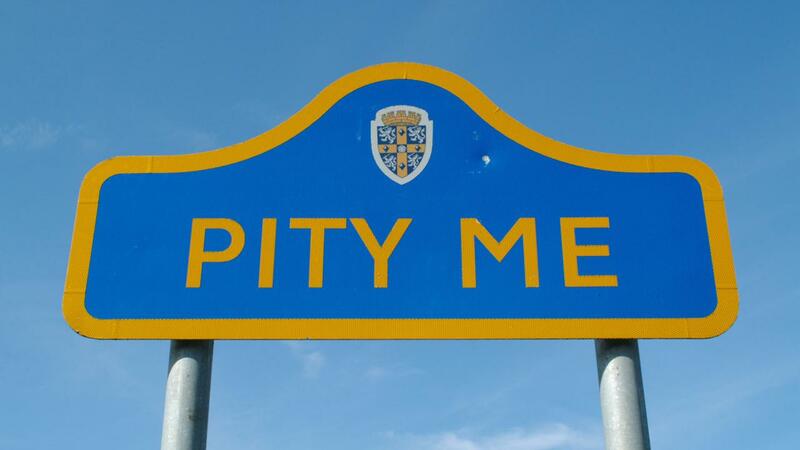 It's a wonderfully informative and somewhat amusing piece on the origins of many of Britain's somewhat odd place names. 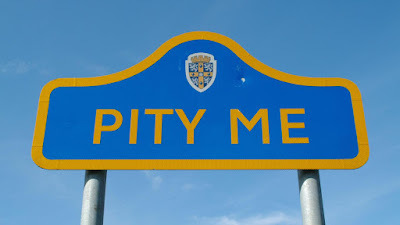 The relationship of this article to heraldry is that it was pointed out that even such little towns as Pity Me (see sign below) have better-than-average heraldry. At least, that's what one commenter said the headline should have read. "The headline to what?" you ask. Why, an article a short while ago (March 4, 2016) by Susan Morrison on the website of the Edinburgh Evening News, of course. She had entitled it: "All fur coat (of arms) and nae knickers, Don" The article is a little bit about heraldry, a little smaller bit about potholes, and a fair bit about one of the U.S.'s candidates for President, Donald Trump. 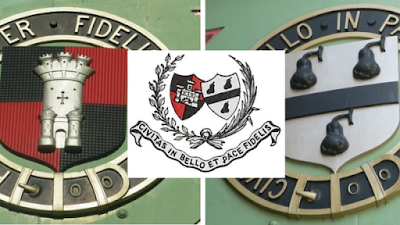 The Lord Lyon can sort out any problems you may have with your heraldry. I know. Hardly a day goes past when I think, jings, look at the state of my coat of arms. My supporters are dodgy and my Latin motto’s gone mouldy. Must take myself along to a Pursuivant for a quick once over on the old quartering of the shield. Of course, I don’t. Peasants like thee and me have no right to the fancy bling of a silken banner above our heads on the field of battle, which basically is what a coat of arms was, or as I like to look at it, brand recognition for aristocratic homicidal maniacs in the Middle Ages. And she goes from that to some of the troubles that The Donald had up in Aberdeenshire with his use of a coat of arms which had not been properly granted and entered in the Register of the Court of the Lord Lyon. I hold no brief nor regard for the fanciful fol-de-rols of the nobility, but every time the snarling tangerine appears, and he’s doing it with distressing regularity, it’s good to remember that rainy morning in Aberdeen when the ghosts of Robert the Bruce’s heralds stood behind their lawyer as he slam-dunked possibly the most repellent man who has ever run for President, and I’m including Nixon. Go Herald Pursuivant. ... that all of the really cool heraldic stuff that I see costs so much? It is the CVSTOS Challenge Pride of Colombia Automatic Limited Edition watch. 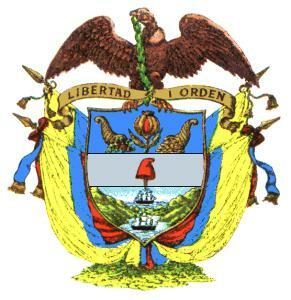 And as you can see in this detail, it has on its face the arms of the South American nation of Colombia. Now, I don't really need a watch. I do have one, but it's a pocket watch that I only wear very rarely with one of my three-piece suits, and it needs its battery replaced, so it just sits in a drawer at home. I also have a self-winding watch that I inherited from my father, which also sits in that same drawer. Because, as I said, I don't really need a watch. I have a perfectly good smartphone that has calendar, watch, timer, and alarm clock apps on it. And because it's also a telephone, I have it with me all the time. So if I need to know what time it is, I whip out my phone and find out what time it is. 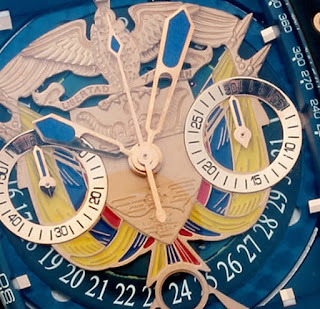 But this watch is really, really cool! And heraldic! But it's ridiculously expensive. 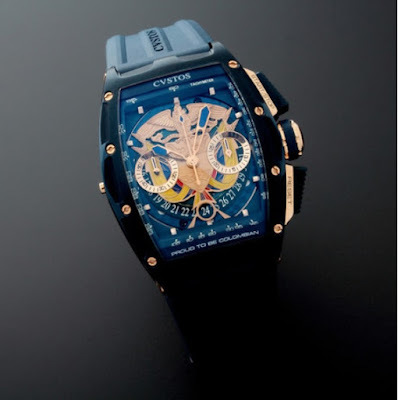 It is marked down significantly, on sale for a mere US$16,999 (down from US$25,000). And I just can't see spending that much money on a watch that I don't really need, no matter how heraldic it is. 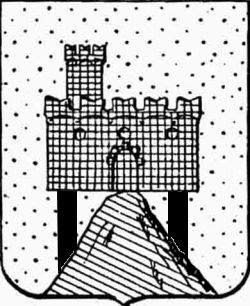 Frans Rekem posted the following drawing of the arms of Rivola (Bergamo) on the Facebook page of the International Heraldry Society along with the question, "How is this working, please? Sneeze forbidden!" A few hours later, he posted another image in which he had fixed the problem. 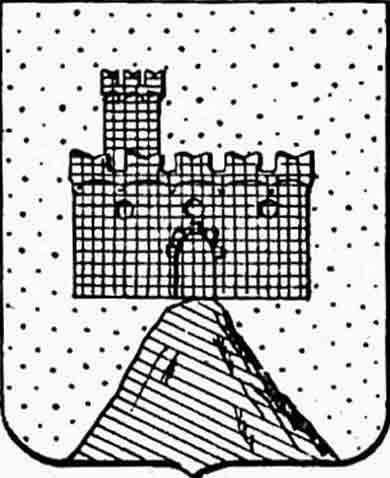 Heraldry. 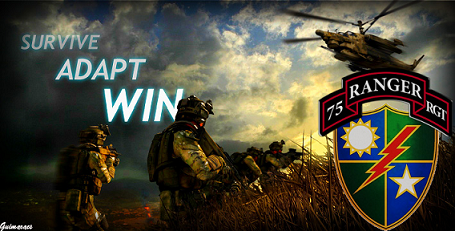 You gotta love it! Under the heading of things that I could not avoid purchasing for myself is the following, which I ran across on the internet the other day. 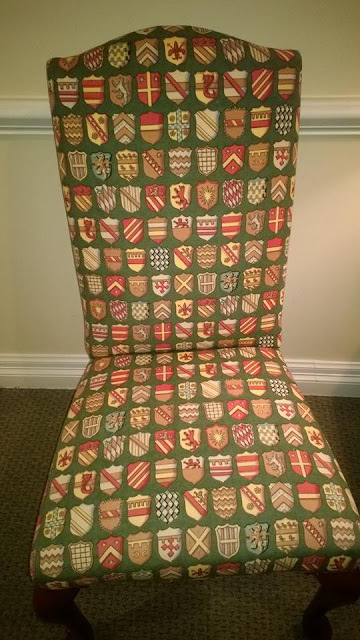 This picture of a chair she ran across in Lexington, South Carolina, was posted by Suzi Thurman. And were I to see it in person, how could I possibly say no to acquiring it, right? 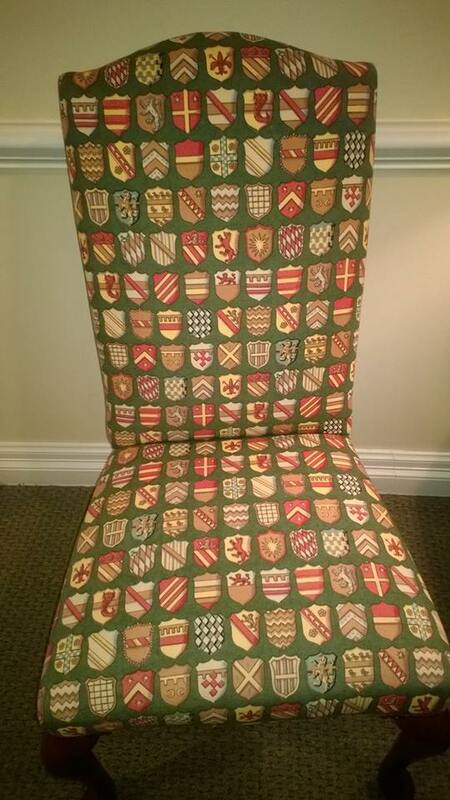 Come to think of it, I could see tracking down a few yards of that fabric to make some nice heraldic curtains! 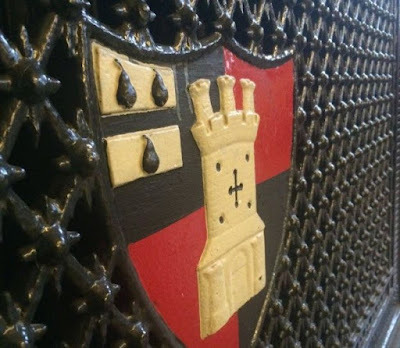 There have been several articles about the bestowal in February by The Heraldry Society (England) of its Corporate Heraldry Award to the Worcester City Council. The bi-annual Corporate Heraldry Award began a few years ago as a comparatively low-key thing, but seems to have recently become a prestigious thing to receive, and there's been a fair bit of news about it this year. The Award is made to cities and other corporate bodies who have, and more importantly, use a coat arms to strengthen their identities. And apparently, Worcester has been doing this in spades. And in other places about the city, you can find the two coats of arms which were combined to create the current one. All in all, it's great to see heraldry used like this, and it's also great that The Heraldry Society bestows this Award on people who do it. I swear, if this were the kind of gift that was passed out to bridesmaids at most weddings, I think I'd be willing to put on one of those poufy dresses myself and show up. 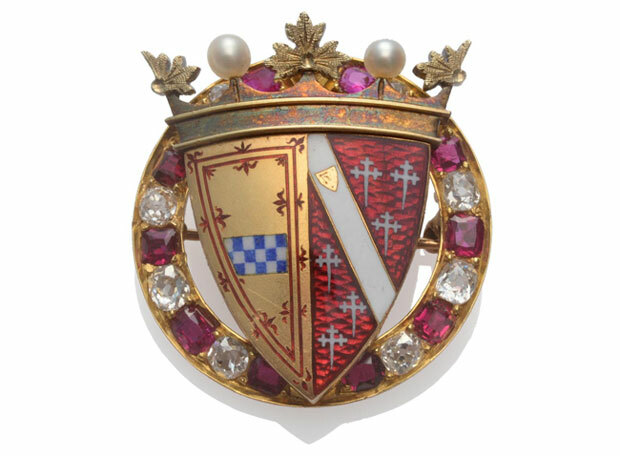 The fine folks over at My Family Silver have put up a picture and the history behind a really nice armorial brooch that was a gift for a bridesmaid at the marriage of John Crichton-Stuart, 3rd Marquess of Bute, to Gwendolin Fitzalan-Howard on 16 April 1872. A gold brooch in Gothic style mounted with an enamelled armorial shield surmounted by a pearl set coronet within a circlet of cushion-shaped rubies and diamonds. Each youthful lady wore as a memento of the auspicious event a valuable gold locket, the centre being in the shape of a shield or escutcheon, on which were enamelled in colours proper the heraldic arms of the Bute and Norfolk families impaled. Round the lower part of the shield, from the top of the dexter chief to that of the sinister, was a band of beautiful rubies and small diamonds, the loop set with the same precious stones. The ornament was surmounted with a Marquis’s coronet, the leaves being formed in diamonds alternating with pearls. I would just call it a really great gift, and one that I might be willing to wear a bridesmaid's dress for a couple of hours to receive. Or, I suppose, I could just save up my money and buy it.